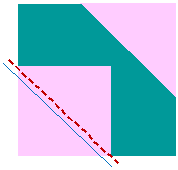 To make a half-square triangle (HST): You will see in my instructions to draw a line on the back side of one or two fabrics (the red line in the image to the left). “Blue” (in the back) & “Green” (in the forefront). Sew them, right sites together, 1/4″ on EACH SIDE of the line you drew (the blue “stitched” lines). Then cut the half-square triangles apart ON the line you drew. You will end up with TWO (2) half-square triangles. Press toward the darkest fabric. Clip your corners (aka dog ears). This tutorial will complete your HST’s! 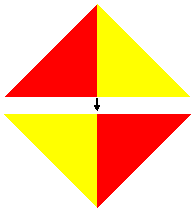 To make a quarter-square triangle (QST): You will see on my instructions to either cut some quilt squares one time or two times. Both of them diagonally, corner-to-corner. When piecing a QST, follow the diagram on the left first, and then follow the diagram on the right to finish your QST! To make a Flying Geese: You will see on my instructions to either cut some squares one times or two. Both of them diagonally, corner-to-corner. When piecing a Flying Geese for a quilt block, follow the diagram on the left first (adding a smaller blue triangle to the larger purple triangle), and then follow the diagram on the right (adding the second smaller blue triangle to the newly created purple/blue component). This tutorial will complete your Flying Geese! If you are making a quilt block that has a lot of Flying Geese in it, is best if you press all of your Flying Geese seams open. To make a portion of a quilt block that calls for Snowball Corners: You will see in my instructions to cut some squares smaller and some larger. The smaller squares will say, “On the back side of the square draw a diagonal line, corner-to-corner, ONE (1) time.” When piecing a portion of a quilt block that calls for Snowball Corners, gather up the larger square and the FOUR (4) smaller squares associated with it. 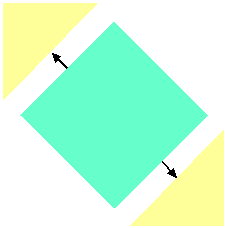 With right sides together, line up the smaller square so that it is perfectly even with the corner and sides of the larger square. Then sew ON the line that you drew (in the image on the left, it’s the red dashed line). 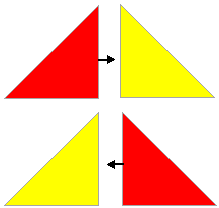 Repeat the same process for the remaining three corners (image on the right shows how to repeat the same process on the opposite corner than the one in the image on the left). This tutorial will complete your Snowball Corners! 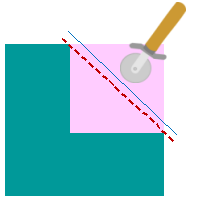 To make a portion of a quilt block that calls for a Square in a Square: You will see in my instructions to either cut some squares one time or two. Both of them diagonally, corner-to-corner. There will also be a larger square associated with it. 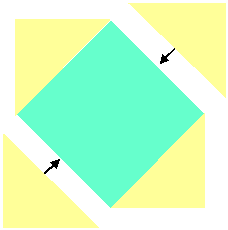 When piecing a portion of a quilt block that calls for a Square in a Square follow the diagram on the left first, then follow the diagram on the right second. Press in the direction of the arrows. This tutorial will complete your Square in a Square portion of a quilt block!